October 26, 2015	(Press Release) - Advanced Network Management (ANM) is positioned for exponential growth and visibility in the IT industry in 2016. ANM has made significant engineering investments with the current engineering team, holding 12 Cisco Certified Internetworking Expert (CCIE) Certifications. These certifications cover all aspects of technology, including Routing, Switching, Collaboration, Data Center and Security. In August, ANM achieved Cisco Gold Certification, further solidifying its reputation as the region's leading IT service provider. The prestigious designation comes after ANM met the stringent training and program prerequisites required, making ANM the sole Cisco Gold Partner headquartered in the state of New Mexico. "ANM's achievement of Cisco's Gold Certification underscores their investment in and commitment to the partnership," says Frank DeCicco IV—Partner Operations at Cisco. "It also recognizes the broadest range of expertise across high growth market opportunities, the deepest level of Cisco Lifecycle Services expertise into their offerings and a measurably high level of customer satisfaction." The message that customer service sets ANM apart in the IT industry was at the forefront of the decision to launch a new company website (anm.com/) earlier this month. "Our consistently high customer service ratings clearly show the ANM commitment to the client," remarks ANM's CEO, Raminder Mann. "It's a key component in the ANM service package and, therefore, central to the story we wanted to tell with our new site." In addition to communicating this core value, Mann says the new website also highlights ANM's broad range of services, engineering excellence, and success at innovating custom solutions for clients. Mann adds that the high-end look of the site is reflective of ANM's ongoing commitment to provide offerings comparable to those of national entities. 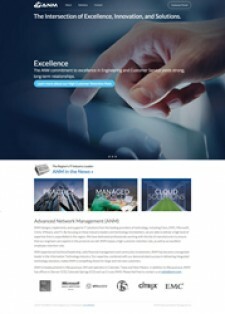 Mann is credited with the bold moves to become a Cisco Gold Partner and to introduce an impressive new website (anm.com/). Before joining ANM, Mann worked for a number of Fortune 100 companies—including Cisco. As CEO, Mann understands his role in keeping ANM on course for even greater success, a role he insists includes ensuring "every employee upholds our core values and culture—then walks out that culture with our partners in business." Over the last 20 years, ANM has grown consistently, earning its reputation as the region's leading IT service provider. Headquartered in Albuquerque, New Mexico, ANM recently expanded its sales and engineering resources to branches in Las Cruces (NM), as well as Denver (CO) and Colorado Spring (CO). ANM has a large engineering team that carries the highest levels of engineering training and certifications from each of its industry-leading manufacturer partners. For more information, visit www.anm.com.